So do you see now why I talk about you all the time? We’ve been through a lot together, and I’ll never leave you. When college ended, I threw myself back into recreational reading with full force. With your spiffy online ordering system, your entire catalog was mine, at quite literally the touch of a button. It’s fantastic: if a book I want is really popular, I can even place myself in a virtual line and you will not only alert me when it is available, you will deliver it to my closest branch for pickup. By the way, your online search and request system is excellent; so much more streamlined than when it first began, Library. You haven’t just sat by and done the bare minimum, no; you’ve continually updated it to make the whole process easy for everyone. I use my online account so much that I’ve memorized my library card number. I love all of the programs you offer at your branches: when my Wee One was just learning to walk, I started taking her to one of the children’s story time sessions; she loved it, and being a stay-at-home kid, she really liked seeing other babies and their moms. We participate in the baby summer reading club (and the adult version, for myself) every summer, and I look forward to bringing her to some of your other childrens’ classes as she grows. She already loves to read, Library, and I couldn’t be happier about that. I see you have some big book sales coming up; Library, there’s nothing – nothing – I enjoy more than a library book sale. I affectionately call it “The Running of the B00ks,” and I prep for it weeks in advance. I gather sturdy paper-ream boxes (they’re the perfect size, because I can stuff one with all hardcover books and still be able to just lift it into my trunk), do a few stretches, and it’s off to the races. I’ll be there, Library: I have found some incredible old books there, and they cost me maybe $.50 a piece. 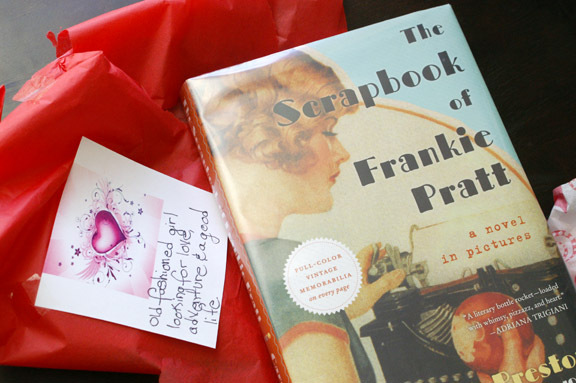 My most treasured items include two volumes on etiquette – everything from invitations to divorce! – from the 1950’s, a book of games and party ideas from the early 1960’s that I live by, an entire set of hardcover, beautifully maintained Audubon children’s illustrated encyclopedias. So you see, Library, you have become part of me. I have so many books here that say “No longer the property of St. Louis County Library” and it’s not even because I accidentally stole them. I own quite a few books by now that used to occupy your shelves, and I’m really proud of that. Frankly, I thought about not writing about this part of why I love you, because I don’t want my secret out; I want all the books for myself, but that’s not fair. Everyone: come to the book sales. If you’re not local, check with your own library to see if they have one; you will not be disappointed, because it’s like your library having a garage sale, except without the scary pottery and old tools. A word of caution to locals: if I see a book I want at the book sale, I will obtain that book. If you are holding a hardcover book, circa early to mid-20th century, and you see someone circling you, put down the book and step away. It’s just me, and I will not harm you, but I will hawk-eye you until you put it down so it can come home with me where it belongs. Thank you. I would be remiss if I didn’t mention how much your vast selection of cookbooks has meant to me over the past few years, Library. I had no idea you had so many! It wasn’t a section I wandered into growing up, but to run this blog involves lots and lots of recipes. I like my recipes from books, because that’s just how I choose to do things, and to be able to borrow your cookbooks without having to drop $30 each time? Life-changing, in terms of what I do. I’ve been able to test-drive cookbooks to really determine which ones belong permanently in my library. I’ve been able to share those books with others, so they can rent them from their own libraries for testing purposes as well. Because of you, I’ve been able to cook and bake all sorts of things I may have never had the chance to, and so have many others. One of two things would happen if you did not exist, Library: I would either go broke buying book after book for both me and my Wee One (Mr. Table reads e-books, so we won’t talk about him right now), or there would be a massive amount of books I would know nothing about because I would have had to limit my purchases. Neither of those is the case because of you. Sure, you entertained me when I was a kid, and I needed you to get through school, but now that I don’t “need” you for something specific, I want you in my life more than ever before. Don’t let anybody ever tell you you’re not important, Library, because you are so important. Library, I want you to know that I appreciate you for all that you are, and all that you do. I am not alone in this; if you’ve seen the comments coming out of the “Dear Library” series, you may have noticed how much other people around the country have loved growing up with their own local libraries. I don’t know about you, but it’s been inspiring to hear how many people out there really love their libraries, and how their moms bringing them to visit has turned into us taking our own kids to visit you. We come with our children, we come alone, we sit in your beanbag chairs, we explore, we relax, we learn. We love you. Thanks from all of us, Library. This may be my favorite recipe of the week: the honeybee cupcake. Oddly enough, Deb from Smitten Kitchen posted – just last night – her beautiful bee sting cake, which is similar to these but in full cake format and, I’m sure, completely amazing. 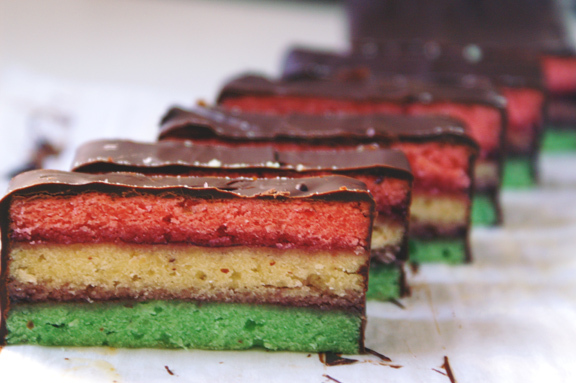 I adapted these from an original full cake recipe as well. As summer approaches, I enjoy more portable things: there are picnics, and barbeques, and meals take on a more relaxed, casual tone. Cakes are great, but around here, warmer weather means sitting for a minimal amount of time and then running around with a big bottle of bubbles for the rest of the evening. Cupcakes work really well for casual events like this, but they don’t have to be boring. This one is very sophisticated, with toasted almonds and an almost-otherwordly honey glaze. Athough it doesn’t look like a kids’ cupcake, per se, both kids and adults will enjoy them. 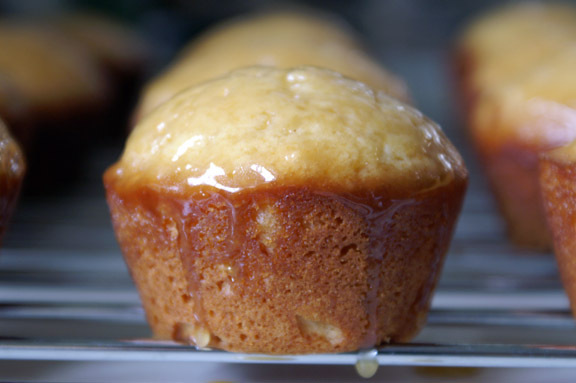 There is no fooling around here; these are very much a honey cupcake, lest you think it’s more like a vanilla cupcake with a honey glaze, so make these using a sturdy-but-mild honey. These are from a book called Vintage Cakes, which all of you should jump on borrowing from your own libraries. It’s beautiful, and there’s so many cake ideas in here which you don’t see in other books, because they are largely older recipes which have been handed down. I daresay it’s like the best of two worlds; vintage cookbooks contain spectacular recipes but that sometimes need major tweaking, and new cookbooks are wonderful, but often lack some of these older throwbacks. This book combines the two beautifully, and I have fallen in love with it. Those of you who really enjoy vintage baking will absolutely flip over this. Makes 16 cupcakes – which, I know, roll your eyes, but yes: you will get to do this process twice for your additional 4 cupcakes. Worth it. *I often talk about how much I am in love with a particular dark wildflower honey from Tennessee. As much as my heart belongs to that honey, I don’t know that I would use it for this recipe, simply because there is so much honey inside it that it could become overwhelming. Use a good-quality honey for this, for sure, but make it normal strength one. Alternatively, experiment with some regional honey like orange blossom (that would be so good in these) or another lighter type. 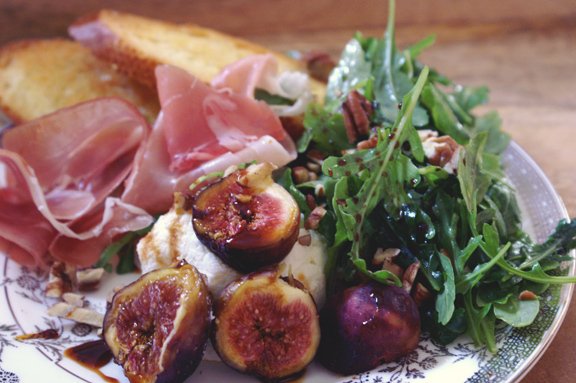 **toasting sliced almonds is easy. Simply heat a skillet over medium heat and throw your almonds in. Keep a close eye on them, flipping often around and around in the pan, until they begin to get a toast going on them. The become very fragrant as they get finished, and they do go from “done” to “overdone” fast, so don’t leave that pan’s side. Pull them off and slide them on to a plate to cool. Stir the honey, sugar, and butter in a small saucepan over medium heat until everything has melted and the mixture is just at a simmer. Turn off the heat at this point, but leave the glaze in the saucepan to stay warm while you make your cakes. Preheat the oven to 350˚F. Grease the insides of a standard-sized muffin tin, bottom and sides, generously. In the bowl of a stand mixer fitted with the paddle attachment, beat the butter, sugar, honey, and vanilla on high until very light and fluffy, 5-7 minutes, scraping the sides of the bowl every few minutes. Turn the mixer down to low speed and add the eggs and egg yolk, one at a time, beating on low until each one has been incorporated. Scrape down the sides of the bowl again. Add the flour mixture in three parts, alternating with the buttermilk, starting and ending with the flour mixture. Keep your mixer on low speed and make your additions just after the last one has been incorporated; the entire process should only take 45 seconds or so. Before you add your last flour addition, remove the mixing bowl from the stand and use a spatula to add in the final flour addition, being careful not to overbeat the batter. Spread the batter evenly among the muffin tins using a 1/4 cup measure as a guide. Your batter will be very thick, so once your batter is in the tins, flatten it out slightly using the back of a spoon or spatula. Clean up any wayward drops of batter, and rap the pan firmly on the counter to get rid of excess air bubbles. Bake until puffed and just barely golden (although you will see the edges have darkened to a deeper golden by this time), 13-15 minutes. Remove from the oven and place the entire pan on a metal rack to cool slightly, about 5 minutes. Do not turn off the oven. With a wooden skewer (believe me, this works much better than anything else), poke holes all over each cake, trying to get them as deep as possible without going through. Using a pastry brush, brush the glaze over the top, starting at the center and trying to keep as much as you can from running towards the sides. As I would say to my Wee One, please practice your patience with this. Once all have been glazed, put the pan back in the oven and bake for another 5 minutes, until the glaze has absorbed. Remove once again, and place on a wire rack to cool again for around 10 minutes more. Using a thin-bladed knife and remembering that these are still very hot, pop them out of their tins one by one and place directly on the wire rack. Place a sheet of parchment underneath (to catch the glaze) and use your pastry brush again to brush each cake with more of the honey glaze. I try to start in the center and let gravity take it where it needs to go, but watch that too much doesn’t run down the sides. 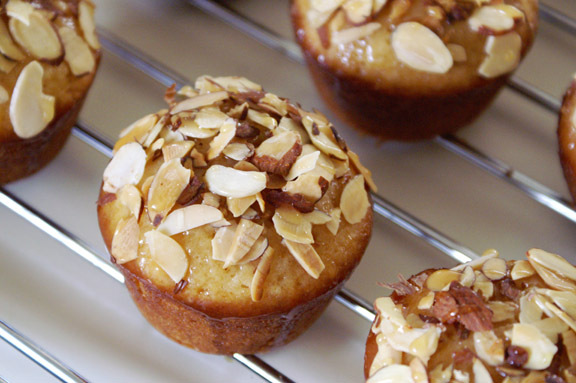 Let these sit for a few minutes to firm up slightly: it’s semi-hot glaze on a hot cupcake, so before you put the almonds on, you want to make sure that the second round of glaze has absorbed into the cake enough to where your almonds won’t go sliding all over. Just use your best judgement, but I gave mine about 15 minutes. 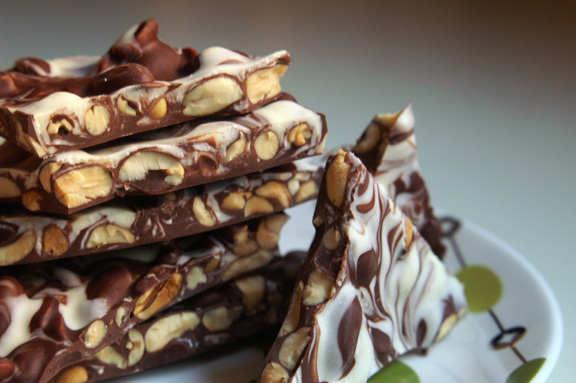 There are two ways to get the almonds over top. I like the messy approach, which is where you simply pour some toasted almonds over each one, using your free hand as both a guide and to press the almonds into the cake so they stay put. You could place the almonds one by one, but then you would be the person who placed slivered almonds one by one onto a cupcake. If you’re that person, wave your flag high; that is something I do not have the patience for. Repeat as you see fit; more almonds catch on the second round, and I had some bare spots to fill. Take a spoon and drizzle lightly with the remaining glaze when you’re ready to serve them. I would say the cake part of these keeps well in an airtight container for several days, but there’s a problem: the almonds get softer and softer by the day, which makes for an odd texture. You could make these more than a day before you serve them, but I would suggest saving the glaze, warming it, dotting a little on there when you’re ready to serve, and then showering your almonds over top at that point. Otherwise, these would be best the same day (or the day after) you make them. I actually tried placing a hold on this cookbook sometime last year (I like to browse Amazon for ideas of books to put on hold and saw this one), but I was not in the system. But I just checked and they have it now, so I just put it on hold. So thanks for the reminder! And I, too, am so thankful for the library. With the amount I read it would cost me hundreds, if not thousands, of dollars a year to buy all those books (not even including cookbooks). And there is no way I could do that! I don’t know WHAT I would do without my library. Oh, and if you’re looking for another cookbook to check out, try Bake It Like You Mean It: Gorgeous Cakes from Inside Out, by Gesine Bullock-Prado. It makes the recipes on Milk Bar look simple. I own it, but haven’t made anything from it yet–that might have to wait until Tova’s in school! Thanks to you, I’ve become quite enamored with the cookbook section of my local library. I’ve flipped through some and known instantly it was a keeper, one I’d have to buy. My Amazon Wish List is filled with these finds (oops) and I’m excited to see what new things I’ll find at each visit. If you’ve any kind of commute during the day or like to listen to something while you work, the audiobook and playaway books are fantastic library items. It’s how my mother and I survive our daily commutes! Um, other worldly glaze? And honey? Very much yes please! Here is a picture of honey drizzle dripping off of a honey cupcake. Haha, the Blind Date a Book is such a cute idea and a great way to read something you wouldn’t normally read! Also, a good way to not judge a book by it’s cover (totally guilty of this…). Nice looking cupcakes! Mmm girl please. Yeah, about these honey cupcakes. I’m gonna need one. I can just imagine licking my sticky fingers after I’ve scarfed down the entire cupcake. Yum! Yum, these are so cute and look really delicious! Love the honey-almond topping, so great! I take the timing of your posts to mean that you and Deb are soul sisters (which I have suspected for some time). The “blind date a book” event sounds awesome. How did it work, exactly? Did you have to come up with a description of yourself and submit it, and they chose the book? Because that would be a fantastic theme for a Valentine’s Day Party, wouldn’t it?? Do tell because I want to try it myself! I had Vintage Cakes out from the library recently, and now feel that I must own it. This happens time and time again. I see a book, reserve it at the library before deciding if I should purchase it, pick it up at the library, pour over it, add it to my extensive i-want-and-gimme list at Amazon, and then repeat. So, for me, the library kinda leads to… poverty. But I can handle that. Books are way better than cocaine. Also, these cupcakes look absolutely delectable. i remember seeing that you had it from your school library: it really does look like you (i can’t believe, honestly, you haven’t purchased it yet). I do the same: every once in awhile i check my cart at amazon to see what i’ve added, and it’s now up to maybe $870 in cookbooks and other things. all of which i must have. so yes, there’s a positive correlation between library borrowing and poverty. but it’s postponed poverty, i guess? so….good. it’s much easier to get books than cocaine anyway. i think. i wouldn’t actually know that. probably. Confession: I’m not really a library person….until I have kids. 🙂 You see, I don’t really like reading, except when I have to when I was in college..and cookbooks are my weakness. Are they even consider books? I read them like a novel though. Anyway, I love going to the library now, with my kids. I’m glad my kids are nothing like me in the way that they LOVE reading, phew! We can spend hours there on each visit. 🙂 These Honeybee Cupcakes look amazing. They definitely make the perfect afternoon snacks. Amy, no judgement! And that’s pretty awesome that even though you’re not terribly into reading yourself, that you make the time to take your kids there; not everyone would do that, so that’s something to be commended. 🙂 And i completely consider cookbooks reading material; they are, at the very least, picture books, but i’ve actually sat down with a few of my more story-heavy ones to read them, so it counts, in my opinion. I’m a believer that loving to read can come in all different forms: my sister never “liked’ reading at all, but she reads the occasional paperback and loves to read magazines cover to cover, so i consider that her way to love reading. 🙂 Take your little ones to the library, and while you’re there, check to see if they have the Vintage Cakes cookbook; i promise you there’s a lot more where those Honeybee cupcakes came from.